LOS ANGELES, April 22, 2014 - Become a part of the phenomenon that captivated the nation! Off the heels of the three-time Emmy(R)-nominated* History Channel miniseries "The Bible," visionary Executive Producers Roma Downey (Touched by an Angel) and Mark Burnett (The Voice, Shark Tank) are back to tell the most important chapter of the greatest story ever told - Son Of God - on Blu-ray(TM) and DVD June 3 and Digital HD(TM) May 6 from LightWorkers Media and Twentieth Century Fox Home Entertainment. 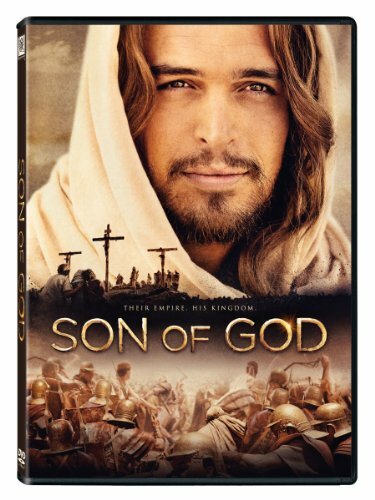 After grossing more than $60 million in box office sales and earning a coveted "A" Cinemascore opening weekend, Son Of God comes home to entertain and inspire millions of families and communities across the globe. "What an honor it has been to bring the story of the life of Jesus Christ to so many people," said executive producer Roma Downey and Mark Burnett. "Now families can bring the story into their homes and enjoy together." Son Of God brings the story of Jesus' life to audiences through compelling cinematic story-telling that is both powerful and inspirational. Told with the scope and scale of an action epic, this film features powerful performances, exotic locales, dazzling visual effects and a rich orchestral score.Son Of God shows the life of Jesus from his humble birth through his teaching, crucifixion and ultimate resurrection. Led by an all-star international cast, Son Of God boasts phenomenal performances from Portuguese actor Diogo Morgado as Jesus Christ, Roma Downey as Mother Mary, Darwin Shaw (Casino Royale) as Peter, Sabastian Knapp as John (28 Days Later) and Amber Rose Revah as Mary Magdalene (From Paris With Love). Oscar(R) and Grammy(R) winning composer Hans Zimmer unites with acclaimed vocalist Lisa Gerrard - along with Lorne Balfe - to create the majestic musical backdrop for this epic production. The Blu-ray and DVD release will feature an unprecedented Spanish-language version of Son Of God that will feature the voices of popular Latino actors Eduardo Verastegui ("Bella," "The Butterfly Circus") as Jesus, Blanca Soto ("Porque El Amor Manda," "Eva Luna") as Mary Magdalene, Jacqueline Bracamontes (host of "La Voz Mexico" "Sortilegio") as Martha, Karyme Lozano ("For Greater Glory," "Quiero Amarte") as Claudia, Giovanna Acha ("Beverly Hills Chihuahua") as Young Mary, Latin Grammy Award winner Alexander Acha as Joseph, Adal Ramones ("Saving Private Perez," "Bailando por un Sueno") as Simon, Carlos Ponce ("Rio," "Couples Retreat") as Thomas and Academy Award(R)-nominated Adriana Barraza ("Babel") as Mother Mary. Verastegui also serves as executive producer of the Spanish language version of the film. Perfect for Father's Day gift giving, Son Of God will be available with a one-of-a-kind 24-page photo book and more than one hour of captivating bonus content, including a behind-the-scenes sneak peek at life on set, as well as cast, producer and director interviews. Additionally the release will feature Son of God: Reborn, which includes a docu-story in English and Spanish titled "Christians Today" that delves into the legacy of Christianity and the role of Jesus in the new generation. *Outstanding Miniseries or Movie; Outstanding Sound Editing For A Miniseries, Movie or Special; Outstanding Sound Mixing For A Miniseries or a Movie, 2013. Twentieth Century Fox Home Entertainment is the industry leading worldwide marketing, sales and distribution company for all Fox produced, acquired and third party partner film and television programing. Each year TCFHE expands its award-winning global product portfolio with the introduction of new entertainment content through established and emerging formats including DVD, Blu-ray(TM) and Digital HD(TM). Twentieth Century Fox Home Entertainment is a subsidiary of 21st Century Fox.